The Official Uncharted 2 Among Thieves Website Is Now Open. We've got the game marked on our calendar for goodness sake (it's actually not that unusual for us really, seeing as we're a games site, but you get the idea - Ed). 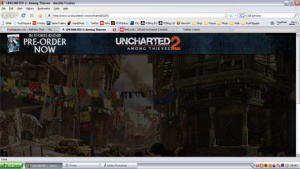 We're here to tell you that you can quell your Uncharted 2 hype over on the official website which just launched. There's plenty on the site, including some neat Nate Drake themed wallpapers.